On Valentine’s Day in fifth grade, we remember sitting at our desks anxiously awaiting the distribution of cards from a shoebox wrapped in red foil. We could count on getting valentines from our girlfriends. Maybe a handmade one with stickers and a doily. Maybe one with a Pixy Stix taped to the envelope. But, oh, the embarrassment if our pile of valentines looked skimpy. We know a man who, decades later, is still grateful that his cousin Shelly was in his class, because that meant he could count on receiving at least one card. In our teen years, we yearned to celebrate Valentine’s Day with a boyfriend, not with our classmates. Wouldn’t it be nice to exchange gifts and write romantic notes to each other? Happily, we fished our wish. We’ve each had a partner for 30-plus years of Valentine’s Days. So over the years, we’ve been there and done that. 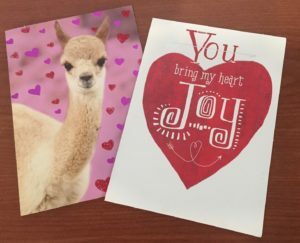 How can we make Valentine’s Day 2019 special? Should we drag our honey to the craft beer brewery for the organic, foraged farm-to-table food pairings? Do we want to get bundled up with heavy coats, hats and gloves and go ice skating? Force him to go to the local “paint and sip” storefront so we can create a masterpiece together? What we’d really like to do is snuggle up together on the sofa with Netflix and a good bottle of wine and a big heart filled with chocolate. While we’re long past the days of exchanging valentines, we still appreciate snail-mail cards from our husbands. That’s because we’re old. We still use the U.S. Postal Service. A few weeks ago, when we went to the drugstore to buy a card, we glanced down the aisle and noticed that every single person browsing the card racks was a senior citizen. But if only old fogies send paper cards, what do the young people do on Valentine’s Day . . . besides the obvious? They send e-cards. We’re tempted; we especially like the e-greeting with the doggie gondolier singing “That’s Amore.” But an e-card would arrive on our beloved’s computer screen alongside work emails and Groupon offers for a buy-one-get-one-free car wash.
Who wants their message of true love sandwiched between a “reminder about the meeting Thursday” and “did you finish the contract for Steven?” And to our generation e-cards just seem too easy. Too disposable. You can’t put them in a drawer to look at later and remind yourself how much you’re loved. We could post our romantic sentiments on Facebook, but then our 284 “friends” would know that our husbands’ nicknames are Snookums and Snuggle Bunny. Our kids would cringe and unfriend us. And we’d never get rid of the targeted ads for Snuggie blankets and rabbit hutches. After considering the alternatives, we’re sticking with the tried and true – old-fashioned paper greeting cards – even though they require a little more effort. We will stand in that aisle with the seniors, reading and rejecting cards until we find the one that says it just right. We’ve always been partial to the ones with cartoon animal couples – the bunnies eating dinner, the squirrels driving a car. Then we’ll each whip up a heart-shaped chocolate cake and present the card to the guy we’ve been married to for decades. We’d both be happy to see him bring home flowers. 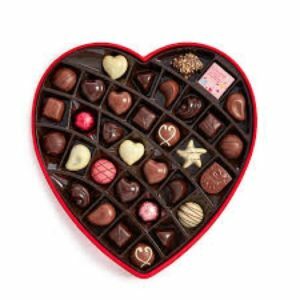 And we are hoping our hubbies bring us one of those big hearts filled with chocolate. So we don’t have to buy it for ourselves. Joyce Eisenberg and Ellen Scolnic are The Word Mavens. They’ve been writing partners for 15 years – dispensing their advice and opinions on everything from new technology and hosting Thanksgiving to sneaking out of a party early. Their features appear in The Philadelphia Inquirer, The Forward, The Writer, Interfaith Family and more. Their hilarious book talk, "Shmoozing with The Word Mavens" garners rave reviews from audiences everywhere. Together, Joyce and Ellen are the authors of the best-selling Dictionary of Jewish Words and The Whole Spiel: Funny essays about digital nudniks, seder selfies and chicken soup memories, a collection of some of their favorite essays. Their third book, Stuff Every Grandmother Should Know, will be published in early 2019 by Quirk Books.